We know that scribes would employ various abbreviations which they could call into play to expedite their work or when they needed to shorten a line to make it fit. In a fanciful derivation for this term I suppose we could imagine a scene when the boss passes by and sees Scribe X leaving out some letters in a word. He shouts “What’s the justification for doing that?” to which Scribe X replies “The justification is making all the lines the same length”. The early type compositors would naturally tend to do the same thing. Now we have apparently figured out that many errors which previously we had thought of as just that, errors, were in fact intentional misspellings. If the line showed signs of coming out to the wrong length, the compositor would simply alter the spelling of one or more of the words, dropping or adding a character at random to make the line fit. 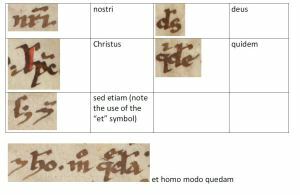 Scholars have made careers collating and explaining these contractions and spelling variants, assuming they were systematic abbreviations or random errors. Bibliographical points have been scored based on conclusions about this or that compositor’s blind spot on the spelling of certain words. But it now seems that many misspellings may not have been the result of orthographical myopia: laziness may have motivated a number of the errors we find in hand set books. Imagine the father of the chapel* harrying the lads to get finished because knocking off time was fast approaching. “Don’t fiddle around with the word spacing. Just get it done!” Scholars are now having to acknowledge that the process may not always have been quite as unintentional as they thought, though equally irrelevant to the author’s intention. Bauhaus design had a good deal of logic behind it when it claimed that unjustified text was more readable than justified. We’ve become used to justification, so it’s often difficult for us to acknowledge how not having it would be OK. In the past, when typescript was done on a typewriter (with fixed spacing) all lines were unjustified — tidying up that right hand margin almost seemed part of what the publisher did. Word processing and the computer have changed this — anyone now can justify their type lines, not just a highly-skilled compositor. Reading studies usually find that unjustified type with a fixed word-space is easier to read than justified lines. Ragged right with some hyphenation to avoid very short lines may be the “best” arrangement of lines on a page. I’m not sure what all the e-readers do. Kindle appears to insist that the “page” be justified, which on an iPhone can lead to some weirdly spaced lines, while iBooks seems to present the page unjustified. But maybe I am just missing the place where they hide the option to display the text in a variety of arrangements. Or maybe these options are decided by the publisher. * Father of chapel is the term used for the shop steward in print unions. Categories Book printing, Book publishing, Why is that?